The timing of the announcement of the sanctions in relation to the upcoming parliamentary elections in Iran can’t be a coincidence. It would appear that the US government has decided that inflicting damage on Iranian voters is a desirable route to getting them to vote against the current government. That is a very dangerous gamble to make, since the government should now be in a position to make the argument that the current hardships are not the fault of Iran’s government but are instead due to US meddling. And meddling it is. 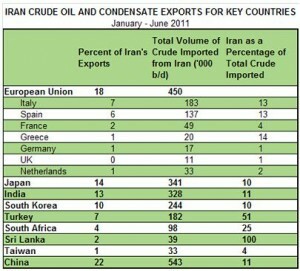 The US can’t harm Iran by stopping its own importation of Iranian oil because it has been more than 20 years since the US imported any Iranian oil. In fact, 1987 is the only year since the 1979 hostage crisis in which the US imported more than 50,000 barrels of Iranian oil a day and no Iranian oil at all has been imported since 1991. So, just as Iran’s threat to close the Strait of Hormuz was taking the attitude that if Iran couldn’t export oil, no Persian Gulf countries could export oil, the US, in implementing these sanctions, is saying that since the US uses no Iranian oil, no country should use Iranian oil. Brent crude is, as of a few moments ago, $113.42bbl and way too expensive to allow a quick economic recovery anywhere. The new sanctions idiocy will no doubt increase the price (unless of course the oil brethren forego windfall profits) and will slow the world wide economic recovery even more. Idiocy. And what will be gained? More excuses to destroy Alaskan lands, more excuses to drive the Keystone pipe line, more excuses to stay in Afghanistan to protect the proposed pipeline, more money for the oil cartels to spread around the WH and Congress? What does the USACorp hope to make Iran do, stop their nuke power program, stop calling out Israel for being war mongering bigoted apartheid pigs, throw out their duly elected government? What? Of course USACorp’s big daddy, Saudi Arabia, will be the prime beneficiary. Quelle Surprise. 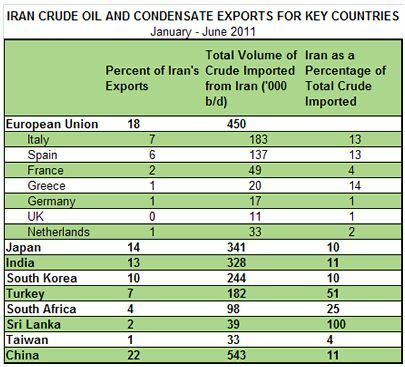 I would note how the conservative leaders of Britain and France can also trumpet “Let’s bomb embargo Iran” because they too import little Iranian oil. @MadDog: Indeed. And conversely, not much noise from Italy and Spain, who do rely on it heavily. @Jim White: And while Germany, like Britain and France, does not import much Iranian oil, their anti-war psychology since WW II means that they can’t personally be involved in bombing Iran, but quiet government cheerleading from the sidelines is likely underway. You don’t get that apparent EU unanimity for an Iran oil embargo without the top dog in EU barking its approval. @MadDog: Funny you should mention Germany. I spent some time this morning trying to understand what Mehr News is saying in this article about Germany being more “logical” than other countries in the negotiations about the sanctions, but finally gave up. I suppose I should go read some of the German press to see if it can shed some light on what’s going on, but haven’t gotten around to that yet. @Jim White: Though I’m obviously not in the German government decision loop, my reading of the entrails is that the EU’s position on an Iranian oil embargo could not have reached the strength we see today without Germany backing it foursquare. This Der Spiegel piece today references an earlier Der Spiegel piece from December 2011 that seems to confirm that Germany is now a strong backer of the Iranian oil embargo but prefers to remain mostly in the shadows. @Jim White: I get the sense that the piece in Mehr News is the official Iranian government view and an attempt by the Iranian government to try to play on German anti-war sensitivities and at the very least, get the German government to be Iran’s interlocutor to the EU, if not Iran’s proxy. From what I see from the outside, this attempt by Iran is not succeeding. Well, we’re now in a position analogous to that FDR forced upon the Japanese in embargoing our exports of oil to them in 1939-40 (I forget the exact date, but it doesn’t matter anyway). They had none of their own and, to fuel their country, felt compelled to move on the Dutch East Indies (now Indonesia) for the oil there. All those Pearl Harbor Survivors can tell us how that worked out. Iran will, because its people will be suffering, almost certainly be forced into some level of violence, lashing out at those who put them in this predicament. There has hardly been a better casus belli than a government pointing at another country and saying to its people: “those other guys over there have caused this”. Hungry bellies translate easily to rage, and rage, to violence. This is a month’s worth of neo-con wet dreams of war compressed into one night. And you thought that because we were negotiating a way out of Afghanistan, the wars would end (For a while)…. I see the usual unintended consequences on the horizon. The G20 powers think they can implement this embargo on their own terms. But, what if Iran decides; screw you, no oil for you? What if they stop shipments immediately and demand full payment for previous shipments and cash in advance for future shipments? Will this action drive Iran and Iraq closer together? What if Iran slashes the price of oil to $55 / bbl and sells on the black market, to anyone willing to come and get it? That’s the problem in a nutshell. I wrote several posts as the IAEA report on Iran came out. The claims in the report that Iran is pursuing a nuclear weapon are at best not very well supported. The Chinese are playing hardball for lower prices. As soon as they get their price they will resume buying and nix any attack by U.S. in the Security Council. We can’t offer China anything except holding more U.S. debt that they don’t want. It’s interesting how the free market works. Why is Britain ramping up sanctions against Iran? …Under the Austere Challenge 12 drill scheduled for an undisclosed time during the next few weeks, the Israeli military will together with America host the largest-ever joint missile drill by the two countries. Following the installation of American troops near Iran’s neighboring Strait of Hormuz and the reinforcing of nearby nations with US weapons, Tehran authorities are considering this not a test but the start of something much bigger. In the testing, America’s Theater High Altitude Area Defense, or THAAD, missile system will be operating alongside its ship-based Aegis system and Israel’s own program to work with Arrow, Patriot and Iron Drone missiles. Israeli military officials say that the testing was planned before recent episodes involving the US and Iran. Of concern, however, is how the drill will require the deployment of thousands of American troops into Israel. The Jerusalem Post quotes US Commander Lt.-Gen Frank Gorenc as saying the drill is not just an “exercise” but also a “deployment” that will involve “several thousand American soldiers” heading to Israel. Additionally, new command posts will be established by American forces in Israel and that country’s own IDF army will begin working from a base in Germany. So how does this effect the Koch Bros. and their dealings with Iran? @TheMomCat: It’s a win-win, all the way around for the Kochsuckers…! They’ll still rake in their obscene amounts of profit, just from the price increase, with the added bonus of having the US public clamoring for the ‘domestic’ Oil Security of the Alberta Tarsands, utilizing the Keystone pipeline which delivers it to their refineries in Texas…! I’ll agree that it’s bargaining rather than politics driving the PRC. I will also observe that there are several so-called civilian operations not tied directly to Sinopec [which has had its own management problems according to Xinhua] will probably buy oil on the side.